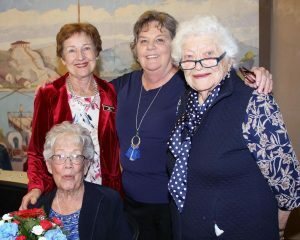 Jane Gresham (seated), Tina Kubishke (back left) and Marinita Phillips (right) were honored for years of service to the Assistance League of Yuma. For volunteer work spanning more than 50 years, Assistance League of Yuma honored three of its oldest members, one of who is the oldest charter member living here. The ceremony at the Colorade River State Historic Park held special significance for honorees Jane Gresham, Tina Kubishke and Marinita Phillips. That was where the League – as a guild – begain its first philanthropic project, the restoration of the old Customs House. In exchange for researching and renovating the Customs House, the organization met there for 20 years before estalbishing their current location at 1054 S. 4th Ave.
Phillips, 94, and the oldest chart member, was recognized for her 53 years of continued service, which began when she was married to the late Gene (Eugene) Brazeel, the first Yuma County manager. Most of her service centered on Operation School Bell®, an ongoing program to clothe school age youngsters who would otherwise have no appropriate school attire. At one time or another, she has held every office that the League has. Although Jane Gresham says that at age 88 she can no longer remember details of what they did during those years, she remembers enjoying those times. One of the scrapbooks at Assistance League offices shows a photo of Gresham along with a few other ladies, shovel in hand, breaking ground for the building that now houses Operation School Bell. By contrast, from August through December this year, the League clothed 856 youngsters, in kindergarten through the eighth grade, from the Yuma area’s nine school districts, including San Pasqual and Sentinel, said Sarah Halligan, communications specialist at the Yuma Crossing National Heritage Area, in a press release. The Customs House’s early renovation was not without its challenges for the 56 ladies who under­ took its restoration. A Yuma Daily Sun article by Rosalie Crowe in the League’s old scrapbooks notes that “after 1955, it fell into disrepair and became a haven for hoboes traveling up and down the river.” Problems the ladies faced included termite-riddled window sills, fireplaces that had no flues and were unsafe, broken windows, locks, bugs, cobwebs and dirt. Crowe wrote in “A Sense of Yuma” from Nov. 27, 1969, that in all approximately $8,000 worth of work and materials had been put into the Customs House. Members spent 9,000 hours in volunteer work for this and Operation School Bell. In fact, work at the organization, whose motto is “All for service, and service for all” has always been voluntary, never paid. It was at the Customs House that needy school children were first clothed. In fact, scrapbook records show that children were being clothed there in September 1977, when Hurricane Kathleen – reduced to a tropical storm – felled a eucalyptus tree onto the corner of the Custom House porch roof. Kids had to remain at the Custom House until parents could come retrieve them. “At one time, we did have members who loved to sew and would sew the dresses for the girls,” said Phillips. “And that was their contribution. They did their own designs, their own choice of colors and ev­erything, but they were well accepted with School Bell.” Other clothing has been donated or purchased through special sales or arrangements with merchants, much as they are today. “Although youngsters are now bussed to the Assistance League’s Operation School Bell to obtain school clothes, originally the members picked up the kids from school,” Phillips said. “But it was very rewarding,” Philips said. “We took them to the old Customs House. We dressed the boys in one bedroom and at that time, the girls in (another area). You know if you’ve ever clothed a child that is in school, and they receive new clothing, that big old grin that they give is worth a thousand words; that’s for sure. After their meeting had adjourned, the ladies were treated to a tour of the CRHSP, where the organization had begun. Besides Operation School Bell, Assistance League’s current programs also include ALBY Bears – teddy bears that Yuma area’s first responders provide for children in crisis. They also provide scholarships for Arizona Western College vocational students and supply Yuma’s Safe House.